Director – Denis Villeneuve, Screenplay – Eric Heisserer, Based on the Short Story Story of Your Life by Ted Chiang, Producers – Shawn Levy, Dan Levine, David Linde & Aaron Rider, Photography – Bradford Young, Music – Johann Johannson, Visual Effects Supervisor – Louis Morin, Visual Effects – Alchemy 24 (Supervisor – Jean-Francois Ferland), Folks VFX, Framestore (Supervisor – Ivan Moran), Hybride Technologies (Supervisor – Joseph Kasparian & Philippe Theroux), MELS (Supervisor – Alain Lachance), Oblique FX (Supervisor – Alexandre Lafortune), Raynault FX, Rodeo FX & Shed (Supervisor – Jean-Sebastian Letorneau), Special Effects Supervisor – Ryal Cosgrove, Production Design – Patrice Vermette. Production Company – 21 Laps Entertainment/FilmNation Entertainment/Lava Bear Films. The world is startled by the arrival of twelve identical alien ships that appear and hover over different locations around the world. Linguist Louise Brooks is approached by the US military to come and translate the aliens’ language. She, physicist Ian Donnelly and several military are flown to the site in Montana and enter the craft. The aliens, vast tentacled creatures that float in a different atmosphere, appear to them on the other side of a transparent wall. Louise attempts to communicate with them and discovers that the heptapods, as they are named, communicate via complex symbols sketched in ink in their atmosphere. Returning daily, they create a linguistic common ground of words and symbols. However, tensions are escalated when the Chinese declare war on the heptapods. Pressure comes from the US government to ask the purpose of the aliens’ visit. The answer comes back ‘offer weapon’. This immediately becomes cause for all countries to cut off communication with each other and go onto a defensive footing. Louise tries to argue that the word ‘weapon’ could be an imprecise translation and just as easily mean ‘tool’. As the situation escalates with the other countries, she goes out on a limb in an attempt to find the aliens’ real purpose. Denis Villeneuve is a Quebecois (French-speaking Canadian) director who has gained considerable attention over the last few years. Villeneuve appeared with the French-language likes of August 32nd on Earth (1998), Maelstrom (2000) and Polytechnique (2009), all of which gained festival play, but did not gain wider recognition until the international hit of Incendies (2010), which was nominated for a Best Foreign Language Film at the Oscars. Villeneuve gained high acclaim with his twin English-language debuts in the same year with the psycho-thriller Prisoners (2013) and the doppelganger film Enemy (2013), followed by Sicario (2015). Arrival opened to massive acclaim and has already started to appear on many Top 10 of 2016 lists. Villeneuve followed this up with Blade Runner 2049 (2017) and is next set to make his two-part adaptation of Dune (1965). There have been a great many films about alien visitors before – all the way from the first major alien visitor effort The Day the Earth Stood Still (1951) to the first alien invader film The Thing from Another World (1951) to cute and cuddly efforts like E.T. – The Extra-Terrestrial (1982) to unserious efforts such as The Brother from Another Planet (1984), ALF (1986-90), My Stepmother is an Alien (1988) and Coneheads (1993). Throughout all of these, the difficulty presented by communications with the alien is almost always glossed over. When it is not a case of aliens arriving already having learned to speak human or even more absurdly astronauts arriving on an alien planet and finding that aliens already speak English a la Flash Gordon (1936) and Queen of Outer Space (1958), we get lip service paid with the invention of devices like Star Trek (1966-9)’s Universal Translator, which was amusingly parodied by The Hitch-Hiker’s Guide to the Galaxy (1981)’s Babel Fish, or else the aliens learning to speak via instant cultural immersion (a la E.T.) or watching tv broadcasts. There have been very few films that have actually taken up the baton of broaching the difficulties presented by communicating with something alien. Stargate (1994) paid lip service by having a linguist in its first contact team but skipped over any discussion of the processes involved. More substantial was Close Encounters of the Third Kind (1977), which saw musical tones as a common ground, while Contact (1997) saw mathematics as a means of communication, although was more concerned with the vast difficulties presented by the distance between us and any other habitable star system. Sphere (1998) dealt with communications between human and an alien craft in interesting ways, even if the end revealed it was not an alien craft at all. The Day the Earth Stood Still had an alien speaking English but showed the greater problem was human fear, while the remake The Day the Earth Stood Still (2008) dealt more with the issue of terrestrial minds trying to grapple with something vast and inexplicable. The granddaddy of all vast and inexplicable alien communication gap films is Solaris (1972) where residents of a space station are driven mad by apparitions manifested from their memories before realising it is a living planet trying to communicate with them. Perhaps the most conceptually challenging of these was not an SF film but a speculative documentary The Visit: An Alien Encounter (2015), which consulted various experts on the likely effects of and the difficulties presented by the arrival of aliens. Arrival – which should not be confused with any of the other similarly titled alien visitor films, the low-budget alien vampire film The Arrival (1991) and David Twohy’s rather enjoyable alien invasion film The Arrival (1996) – immediately leaps to the head of the cue in taking on the subject of alien linguistics. 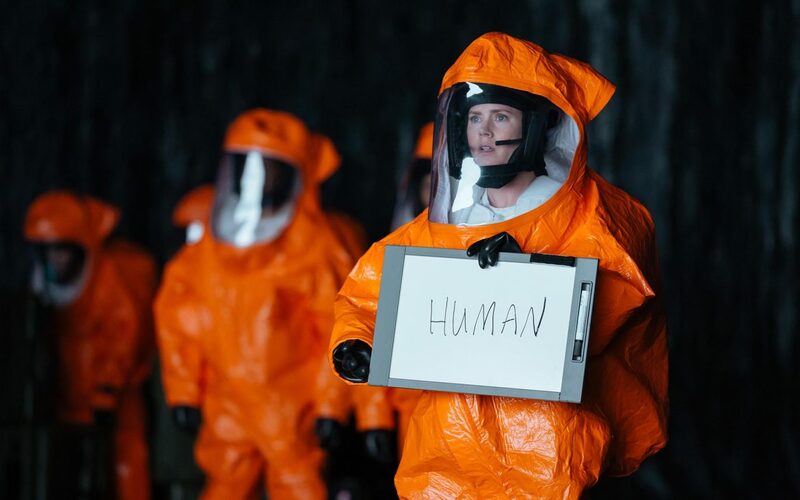 Rather than gloss over the issues of talking to something that is not even humanoid but thinks in entirely different ways, Arrival tackles head-on the need of establishing a common vocabulary, the problems of misunderstanding that conceptual differences (such a no concept of linear time) would give. The film gets full marks for namedropping the Sapir-Whorf hypothesis (which in actually a little bit more theoretical than the film makes the case for it), while having employed a bevy of linguists and visual artists to conceptualise an alien alphabet. It feels like the first film to grapple with the enormity of these issues. Arrival consistently wowed me soon after it started in. It is not just the fact that it is an intelligent and extremely well written film amid a multiplex wasteland where the rest of the year’s efforts on the issue of alien contact are represented by The 5th Wave (2016) and Independence Day: Resurgence (2016). It is that Denis Villeneuve, with great accompaniment from Johann Johansson’s stentorious score, creates a fantastic sense of building to something vast and beyond our understanding. There are few alien films that achieve that sense – mostly they are just like Independence Day (1996) in substituting vastness of size and special effects for any genuine wonderment. The scenes entering into the ship, the weird gravity effects, the meeting with the aliens through the opaque wall and their attempts at communications all have you fascinated. This is a film where nothing can be considered cliche and remains consistently intelligent the entire way. Boiled down to it, the basic plot that Arrival eventually arrives at is one that is not too different to the original The Day the Earth Stood Still – aliens arrive, the military get trigger happy, it is left down to the scientists to achieve a common understanding and find that the aliens are peaceful. Arrival is essentially The Day the Earth Stood Still where we have jumped from the implied political tensions of the Cold War era to those of the modern age. This does bring us to the film’s eventual denouement, which comes as a considerable and clever left field twist that slides very nicely into place. It is a case of the film having borrowed more than one or two leaves from Kurt Vonnegut and Slaughterhouse Five (1972) – the aliens are essentially Tralfamadorians. I won’t spoil it for you any more than that. It left some people disappointed that the film goes out on more of a conceptual ending than a big effects driven one but then it is not that type of film. The screenplay came from Eric Heisserer who also written genre works like the remakes of A Nightmare on Elm Street (2010) and The Thing (2011), Final Destination 5 (2011), Lights Out (2016) and subsequently went on to Bird Box (2018). (Winner for Best Film in this site’s Top 10 Films of 2016 list. Winner for Best Adapted Screenplay, Nominee for Best Actress (Amy Adams) at this site’s Best of 2016 Awards).